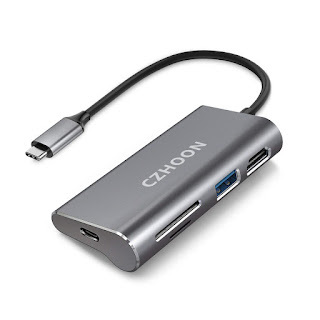 Connect More Devices: The USB C hub turns one type C port into 5 ports, which allows your MacBook Pro or other type c devices to connect with multiple peripherals simultaneously. The space gray aluminium-alloy body also makes the hub the perfect partner of your new MacBook Pro. Speedy Data Transmission: transfer data at the speed of 5 Gbps through USB 3.0 port, which is 10X faster than using USB 2.0. Provide SD card slot and Micro SD card slot for extra data transmission needs. Keep Device Powered: Never worry about your device would be out of power. The type C adapter provides 87W Power Delivery type c port for rapid recharging. 4K HDMI Output: Streaming 4K UHD or Full HD 1080p video to HDTV, monitors, or projectors in extended screen without any blur and distortion. Super Portable Design: Ultra-small size for you to put into pocket and carry around. Worry-free warranty: All our products come with one year replacement warranty to guarantee 100% customer satisfaction.